The 15 tracks on the CD beautifully balance the two musics. About half are from the Himalayan tradition and half are songs from the Appalachian tradition with members of each community adding their own cultural history and musicianship. While being deeply grounded in the traditions, this music has developed a unique and new sound as the musicians have woven their styles together into a wonderful tapestry of sounds. The CD has an amazing collection of musicians. Danny Knicely and Tara Linhardt started recording the album in Nepal with the Gandharba musicians and themselves; then added an all-star line up back in the US who were each excited to volunteer to be included in this ground breaking work. You will hear such Grammy award-winning musicians such as Tim O’Brien and Curtis Burch as well as the International Bluegrass Music’s Association’s Best Banjo Player of the Year and Smithsonian Folkways recording artist Tony Trischka. Also featured on the album is Riley Baugus, who has become an iconic figure in Old-Time music with achievements such as creating much of the music for the Academy Award winning film Cold Mountain. The list of accomplished musicians continues with Abigail Washburn, Mark Schatz, Paul Brown, and Aaron Olwell who also give great performances. Finally, Matthew Olwell added his percussive dance rhythms to a few of the songs for that added punch. 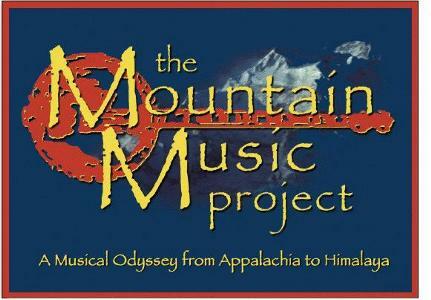 The Mountain Music Project: A Musical Odyssey from Appalachia to Himalaya follows the journey of two traditional musicians (Tara Linhardt and Danny Knicely) from the hills of Virginia to the mountains of rural Nepal, where they explore the extraordinary similarities between the Appalachian music that is now known as Bluegrass and Old Time and the Nepali Himalayan folk music and culture, particularly focused on the traditional musicians of the Gandharba caste. The film, directed by Jacob Penchansky and shot in both Nepal and Virginia, has great interviews, scenes, and music with influential musicians. Interviews with Mike Seeger of the iconic Seeger family of folk music and Sammy Shelor, four time International Bluegrass Association Banjo player of the year, inducted member into the Virginia Country Music Hall of Fame, and leader of the award winning Lonesome River Band. One also hears perspectives on the history and the culture of the music from other well-respected musicians who have also grown up in the mountain music cultures, some of whom had performed and toured with such greats Bill Monroe and Charlie Monroe. The film has already won many awards, such as Best Independent Documentary from the Carolina Film and Video Festival, Best Film Award at the International Folk Music Film Festival Nepal, and the Sierra Nevada Award at The Mountain Film Festival. Curtis Burch Grammy award winning musician and one of the founding members of the legendary and pioneering bluegrass band New Grass Revival.Two traditional musicians from the hills of Virginia take you to the villages of rugged Nepal, where you discover the amazing similarities between Appalachian and Himalayan folk music—and the eerily parallel heritage that gave birth to them both. This vivid portrayal of endangered music and culture celebrates remarkable instruments, foot-tapping sounds, and the people who create them.